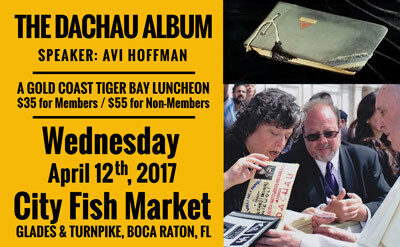 Avi Hoffman and Shari Unger will speak at City Fish Market in front of the Gold Coast Tiger Bay Club about the Dachau Album on April 12th, 2017. Arnold Unger, at 15 years old, survived the concentration camp in Dachau, Germany. Upon his emigration to the United States in 1947, he had in his possession a leather-bound personalized album consisting of 30 captivating color drawings illustrating a sequential artistic narrative of life and death in Dachau – an Artist’s Diary. The album also contains several Nazi uniform patches, a swatch of a prisoner’s uniform and hundreds of photographs portraying the horrors of the camp, followed by the jubilation of the prisoners upon liberation and their attempts at a normal life. The artwork in the Dachau Album was created by a Roman Catholic Polish political prisoner by the name of Michael Porulski who had been in various concentration camps throughout most of World War II. Following the liberation of Dachau, Porulski spent the rest of his life wandering the world and eventually died in England in 1989, alone and penniless. The Dachau Album Project tells the compelling stories of these two men, seeks to uncover the mysteries contained within it and relates the experience of the Holocaust in a way never depicted before. The Dachau Album was evaluated by Holocaust experts at The International Tracing Service and the Bavarian State Archives, and was deemed to be historically unique and an artistic treasure. This impressive new discovery is now being revealed to the public. The Dachau Album Project tells the compelling stories of these two men and seeks to uncover the mysteries contained within it and relates the experience of the Holocaust in a way never depicted before. Please join us on April 12th. For this event the normal non-member rate is dropped. Everyone is entitled to lunch at the lower, member rate.